Professor Deep Saini is the Vice-Chancellor and President of the University of Canberra. 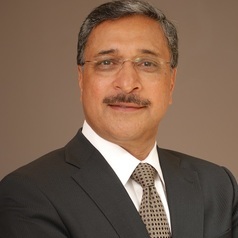 Professor Saini was previously the Vice-President of the University of Toronto and Prinicpal (chief executive) of the University of Toronto Mississauga, where he was also a Professor of Biology. Professor Saini began his academic career in 1982 at the University of Alberta and subsequently served as the Director-General of the Plant Biology Research Institute at the Université de Montréal and Dean of the Faculty of Environment at the University of Waterloo. An educational visionary and distinguished scientist, his research on plant biology and biotechnology has focused on the cellular mechanisms behind crop survival and yield in hazardous environments. At the University of Toronto Mississauga, Professor Saini led major expansions and internationalization of enrolments, hired nearly 100 additional professors, and oversaw a $250 million expansion of facilities. Under his leadership, the University of Toronto Mississauga launched the Mississauga Academy of Medicine (a medical school), the Institute for Management and Innovation (a novel sector-oriented business school), the Centre for South Asian Civilizations, the Professional Accounting Centre and the Centre for Cancer Stem Cell Therapeutics. Professor Saini has served as the President of the Canadian Society of Plant Physiologists and Federation of Canadian Plant Science Societies. He has been editor of several scientific journals, sat on the Advisory Council on Corporate and Social Responsibility for Export Development Canada, was a member of two overseas trade missions by the Ontario Premiers, and served on the board of the United Way of Peel Region. He currently sits on the board of the Research, Innovation and Commercialization Centre and the Economic Development Advisory Board of Mississauga.